How good is Nico Rosberg? It's a key question, one that's lingered in F1 for a while, without ever really being answered definitively. But you could argue that today he went a long way to answering it and in the affirmative, as he claimed his ever first pole position, and in a style that had brio more associated with someone who's been taking F1 poles as of habit for years. It's a pole that's been coming for a while. 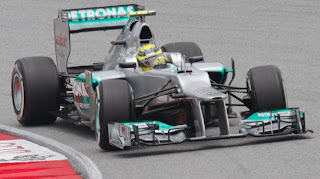 The Mercedes has looked as good as anything on every Saturday of this season thus far, and for the Mercs' qualifying supremacy we've grown used over time to looking at Rosberg rather than Michael Schumacher, but in both of the first two rounds Rosberg fluffed his lines at the vital moment (leading many to nod knowingly that Nico possibly wasn't all that after all). But he was syllable perfect today. He stuck in a peerless lap in the crucial final session that was half a second clear of anyone else's best efforts, and then, while everyone else piled out for second runs, Nico instead left his car and strolled down the pit lane with an air of absolute serenity. And he was right to be confident, as no one even cut the gap let alone threatened to usurp him. Not even Lewis Hamilton, who's looked mighty all weekend and always goes well at the Shanghai track, could. He did set the second quickest mark, though that converts to seventh on tomorrow's grid thanks to a gearbox change penalty. This in turn means it'll be a Mercedes lock-out of the Chinese race's front row. It therefore makes for fascinating anticipation of tomorrow's race. The evidence of the year so far, and on practice running at Shanghai, is that while the Mercs can 'switch their tyres on' effectively for a qualifying run (especially helpful in today's cool conditions), the performance drops off relatively rapidly over a race stint. But leapfrogging them won't be as simple as that makes it sound. For one thing, in first and second places the Mercs are in a position to control the race (and how many races did Vettel win last year without the fastest race car but with pole advantage?) and the Silver Arrows fly in a straight line. 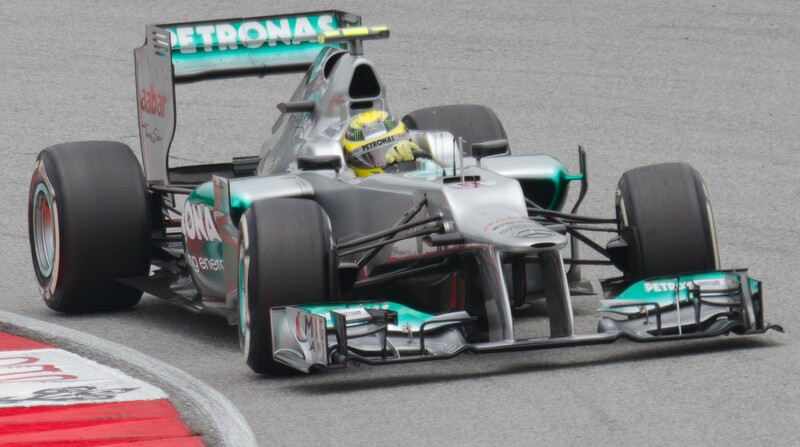 And Rosberg, as mentioned, was a full half second quicker today so has pace to play with. Further, while one may look to the McLarens and Red Bulls for race day preponderance, the highest of them on tomorrow's grid will be Jenson Button down in fifth (followed in turn by Mark Webber and his team mate Hamilton - who'll be worthy of watching tomorrow and will be relieved that those whom he'd consider his championship rivals aren't too far ahead). So even clearing the cars to get a crack at the Mercs won't be the work of a moment necessarily. This applies especially to Kamui Kobayashi, who will start third after a stellar and timely qualifying run, shedding some of the raggedness seen from him in the first two rounds. The Sauber has been a brilliant race day car all year and looks after its tyres beautifully (I don't believe Sergio Perez's run in Malaysia was a one-off or all down to the weather). Kobayashi looks to be in a brilliant place for tomorrow to fight for victory (no exaggeration), particularly given the question marks over the Mercs' ability to sustain their speed over a stint. And if Kobayashi can be the first to clear the Mercs' road block in the race it could be his opportunity to build a decisive advantage. 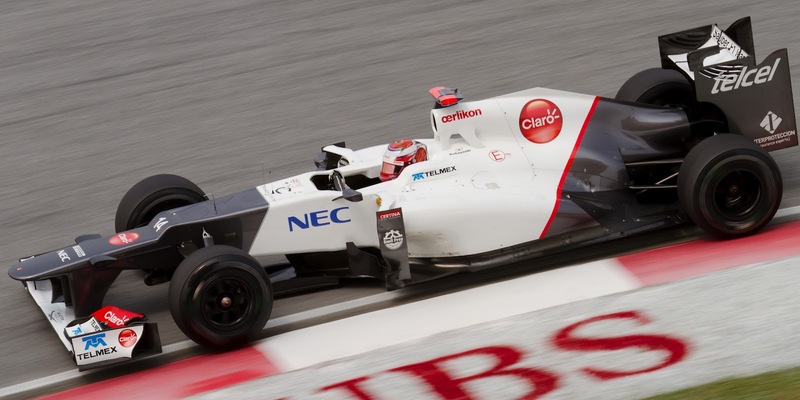 Hopefully those on the Sauber pitwall will have also learned to shed some of their caution seen in Malaysia. Perez lurks in eighth. And Kimi Raikkonen drove wonderfully today, and will start fourth. It's like he's never been away. And hopefully we'll finally tomorrow see how good the Lotus is in a race running at the sharp end. Circumstances have conspired to deny us that thus far in 2012. And it seems astonishing to think I could get this far into a qualfiying report without mentioning the qualifying master Sebastian Vettel. For the first time since 2009 Seb didn't even make the top ten. There wasn't much wrong with his quickest lap in the second session, beyond the car looking a bit unstable at the rear under barking (which some speculate may be related to his exhaust set up preference, discarded by team mate Webber), which in turn meant he wasn't hitting each apex as you'd except. There was but two tenths of a second covering the top ten, and Vettel was squeaked out of it and will start in P11. It continues a frustrating year thus far for Seb, and it's now three rounds out of three that Webber's started ahead of him in 2012. It all adds up to the most intriguing grid for an F1 race for many a meeting. Make sure you're in front of a television for tomorrow's race. It's a race that could go any way.